How does Wi-Fi work? Wi-Fi is the wireless version of a wired Ethernet network. To simplify, Wi-Fi is basically just radio waves broadcast from a Wi-Fi router, a device detecting and deciphering the waves, and then sending back data to the router. The frequencies WiFi works at is 2.4Ghz or 5Ghz, ensure no interference with cellphones, broadcast radio, TV antenna and two-way radios are encountered during transmission. Wi-Fi works over longer distances than Bluetooth or infrared and is also a low power unobtrusive technology, making it suitable for portable devices such as laptops and palmtops. Unless adequately protected, a Wi-Fi network can be susceptible to access by unauthorized users who use the access as a free Internet connection. 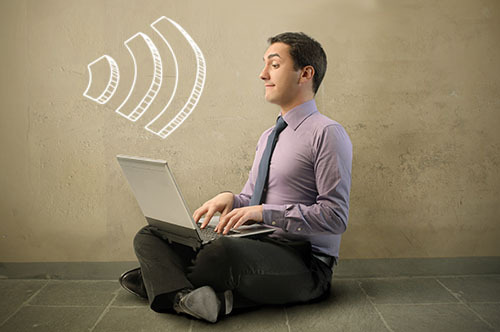 This post will be focusing on how to boost WiFi signal. Your WiFi signal may not be strong enough due thick walls, far distance or various disturbance and what can you do to boost WiFi signal and to extend WiFi range if another WiFi router is not available? 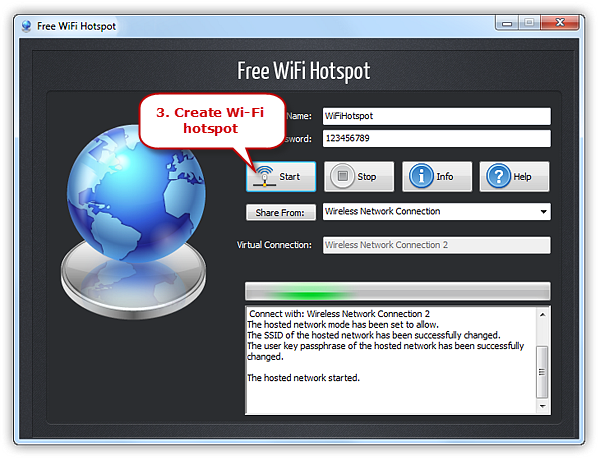 You may have found many ways online but here’s a fast and effective way: just download and install Free WiFi Hotspot on your laptop and make it a virtual WiFi router! When you laptop receive the signal from your WiFi router, Free WiFi Hotspot can repeat the signal and make it go further! Now you can have WiFi connection in every corner of your house with just a laptop and Free WiFi Hotspot installed. In this post we’ll show you the fastest way to boost WiFi Signal / Extend WiFi Range with Free WiFi Hotspot in only 2 clicks! It’s sometimes an obvious need for all of us nerds to turn our laptop into a virtual WiFi router – like to share our laptop Internet connection with other WiFi enabled devices like Android phone, iPhone, tablet, etc. The process to turn your laptop into a free virtual WiFi Router never seem to be complicated with Free WiFi Hotspot. It is a professional yet easy-to-use tool for users to build their personal WiFi hotspots in a fastest way. Although you don’t know anything about computer network knowledge, you can turn Windows desktop, laptop and notebook into WiFi hotspot to share network with other devices without hassle. You can select the source of Internet and have the option to restrict the number of devices that can be connected to your hotspot. If needed, you are allowed to know the details about connected Wi-Fi clients and their resource consumption. It has a UI that has minimal elements arranged in an easily understandable way. 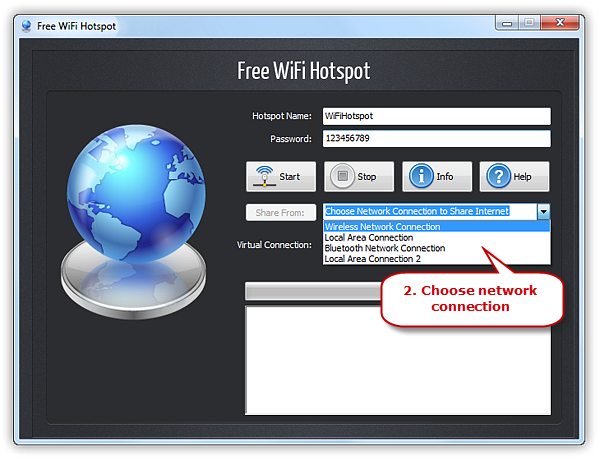 Once installed, Free WiFi Hotspot needs only 2 clicks of button to create the WiFi hotspot on your laptop! Launch Free WiFi Hotspot and for the fastest hotspot creation, you can skip the hotspot name and password settings part and use the default SSID and password. Click “Share from” to choose the network connection from internet connections. To boost the WiFi signals and extend WiFi range, just choose WiFi connection. Click “Start” button to create the Wi-Fi hotspot. Tips: Now you get the fastest way to boost WiFi signals, but for long-time and safer use from free loaders, it is recommended to set your own SSID and password.